Description: The development of Paddington began at the end of the Napoleonic wars, when the Bishop of London granted permission for building on his estate north of Hyde Park. 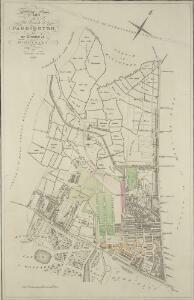 Under Gutch's supervision, works continued into the 1850s, extending to Bayswater and the Edgware and Harrow Roads. The title of this plan appears at top left, with compass rose at top right and scale bar at bottom left. It shows the final street plan, with the Bishop of London's estate outlined in green, the Great Western Railway terminus in red, and the Paddington estate in yellow.